ChatterEmail+'s setup is a snap, even for several accounts. Palm's treo PDA/phones come with VersaMail software for standard POP and IMAP e-mail. For more-robust features and BlackBerry-like "push" service that delivers messages as soon as they arrive on a corporate server, you used to need costly server software or a less pricey--but sometimes flaky--desktop redirector. Now Treo 650 and 700p users have a new option: ChatterEmail+ 2.0. 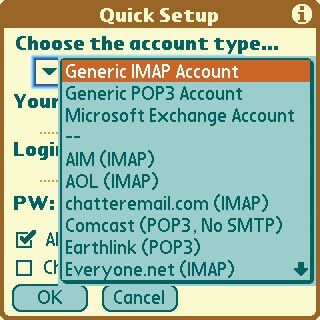 The application needs no server software and costs a reasonable $40 for use with IMAP accounts, or $60 if you purchase the Exchange (2000 or later) plug-in, which costs $25 if bought separately later. ChatterEmail+ supports POP, but without push service. I tried a shipping copy of version 2.0 (and a preproduction version of the Exchange add-on) on my Cingular Treo 650 and on a Sprint Treo 700p. When I pointed their browsers to get.chatteremail.com, the software installed itself within a minute or so (within only seconds on the 700p). Messages from the personal and Exchange accounts began appearing immediately, color-coded according to my preferences (or viewable by account). My Notes messages, though, never showed up--ChatterEmail+'s IMAP push function depends on a server extension called IDLE that current Lotus Domino mail servers don't support. Nevertheless, if your business mail server meets ChatterEmail+'s push requirements, it's a no-brainer if you're willing to pay a modest fee for timely delivery of--and features for managing--work-related mail on a Treo. Affordable program pushes e-mail to your Treo, freeing you from IT support or a poky server.